Configure – Tag: Opens a new window for Tag configuration. 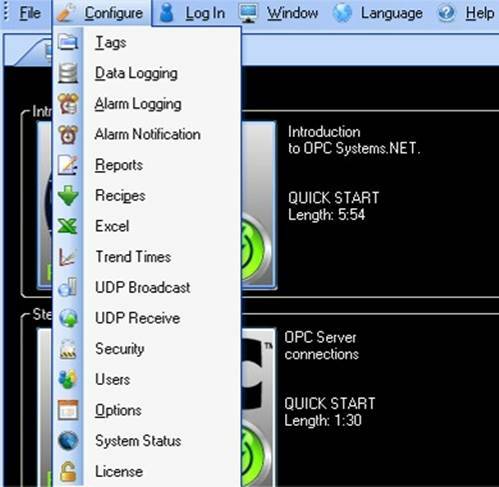 Configure – Drivers: Opens a new window for Driver Interface configuration. Configure – Data Logging: Opens a new window for modifying data logging. Configure – Reports: Opens a new window for modifying report executions. Configure – Recipes: Opens a new window for modifying recipe executions. Configure – Excel: Launches Excel formula wizard. Configure – UDP Broadcast: Opens a new window for modifying one way network transmission. Configure – UDP Receive: Opens a new window for modifying one way network receiving client. Configure – Security: Opens a new window for modifying security configuration. Configure – Users: Opens a new window for modifying security users. Configure – Options: Opens a new window for modifying startup and execution options of a Service. Configure – License: Opens a new window for modifying the license of the local system. Window: Select an existing window already opened. Language: Select desired language for configure application. Help – Open Automation Software: View this help file. Help – Training Videos: View on-line training videos. Help – Training Guide: View Quick Start Example section in this help file. Help – Versions: View current installed versions and check on-line what recent changes have been made to Open Automation Software product features.